1. Who You Gonna Be? 12. Where Do All the Tears Go? Many of the songs feature clean voice and piano arrangements. A few add in bass, percussion, tenor & baritone saxophone, and flute. The first time my daughter heard "Heart of a Warrior", she asked me to play it over and over until she learned it. Now she can sing it to the beat of her own heart and I can't think of a better song to carry her through her life. While You're Alive is a beautiful, zany, inspiring, sing-along-at-the-top-of-your-voice CD! I love her music and this is not a disappointment. I actually got two of her albums at the same time...one I ordered and one as a gift. Both are excellent...soothing and lovely rhythms. 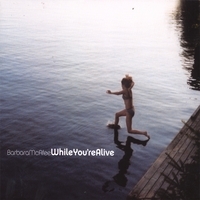 While You're Alive has something for everyone to enjoy, from the catchy Brain Rats to Healing All Generations, the instrumentation is diverse and Barbara's clear crisp voice moves ones mood from mellow to enthusiastic to inspired. Every cut is a win-win! Play it in the car and your trip will fly by, play it at home and dance, sing or just mellow out.